Home / Unlabelled / BREAKING NEWS: Oby Ezekwesili Withdraws from Presidential Race. BREAKING NEWS: Oby Ezekwesili Withdraws from Presidential Race. 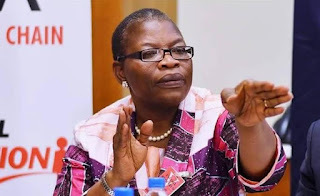 The presidential candidate of the Allied Congress Party of Nigeria, Dr. Obiageli Ezekwesili has announced her withdrawal from the presidential race. The statement reads: “This decision followed extensive consultations with leaders from various walks of life across the country over the past few days. I deem it necessary for me to focus on helping to build a veritable coalition to ensure a viable alternative to the #APCPDP in the forthcoming elections.